Have you been at Towne Place Hotel? Write a review!!! 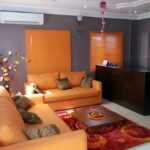 Towne Place Hotel is located off Adeba Road in Epe, Lagos. This hotel provides free WiFi for all guests. Each room features full air-conditioning, a flat screen TV, a refrigerator, a reading desk, floor tiles and an en suite bathroom.